I’m going to Belize in 2 weeks! I have been invited by the Belize Tourist Board on a “FAM” trip. This is travel industry lingo for “familiarization”. I, along with a bunch of other travel industry professionals, are going on a somewhat insane itinerary: we will visit 27 hotels in 5 days! I wouldn’t call that fun, but many of these are places I have heard of for years but never gotten to, and I am looking forward to seeing them. We will be staying in San Ignacio, Mountain Pine Ridge, Placencia, Hopkins, and San Pedro on Ambergris Caye. I’ll be posting more about the trip when I get there. 1 Belize is cheap and easy to get to. That is huge. If you have ever been on a 14 hour flight to Australia, you will know what I mean. Belize has all the exotic qualities of Tavaraua, Fiji, but it takes 70 hours to get to Fiji, and costs about $3000! Your flight to Belize is 2.5 hours from Houston, Dallas, or Miami, and it will cost about $6-800, depending on where you start out from, and what time of year you plan to visit. And because of #1, we get to #2: You don’t have to take as much time off work because you can get there easily in a day! 4 The weather is great in Belize when it is lousy in the US and Canada. 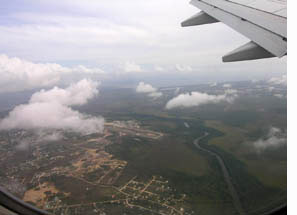 During the peak tourist season in Belize (November – April) the weather is balmy. Temperatures in the mid 80s to low 90s, slight breezes of 12-15 mph, sunny with scattered clouds, and the ocean is 82 degrees! It’s truly everything you think of when you say “Paradise”. 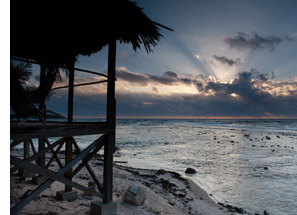 To find out more about Belize weather, visit our website. 5 You get to live your Gilligan’s Island fantasy: Beach huts, palm trees, white coral sand, neon-turquoise, crystal-clear ocean water, and tiny coral islands surrounded by colorful fish. If you visit our island when Charlie is working, you will also get to meet The Professor himself! 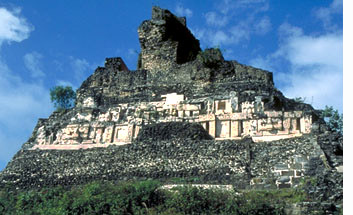 6 Belize is an area steeped in culture. History lovers are in seventh heaven. The Mayan culture, both historic and modern, is easily accessible. You can stay with a Mayan family in a small village, or visit one of many Mayan ruins: Caracol, Lamanai, Xunantunich, Nim Li Punit, Altun Ha, Cahal Pech, and Lubaantun to name a few. And unique to Belize are the Mayan caves. Tours are offered daily to Actun Tunichil Muknal, Che Chem Ha, and Footprint Cave, or the more adventurous can visit Chiquibul Cave. 7 English is the official language and US dollars are accepted everywhere. This makes traveling in Belize very comfortable for American and Canadian tourists. 8 You won’t be subjected to 14 hour chicken-bus rides! Belize is small, only about the size of Vermont, so even though there is a huge variety of things to do in Belize, you don’t have to spend hours between activities. In one week it is easy to raft an underground cave system, surf a Caribbean wave, climb a Mayan ruin, snorkel amidst colorful angelfish, run a jungle whitewater river, windsurf in your shorts across 80 degree turquoise waters, hike into a Mayan ceremonial cave, and learn to roll a kayak. In fact, we have a trip just like that, it is called Belize Adventure Week. 9 You get to eat lots of fresh fish. 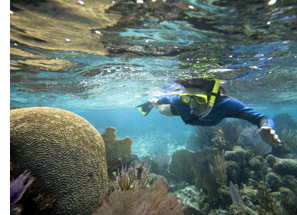 Belize offers the opportunity to enjoy fresh-caught lobster, grouper, snapper, and hogfish. There are excellent restaurants all over the country taking advantage of nature’s gifts from the sea. 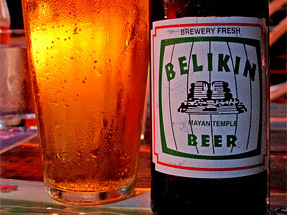 10 You also get to drink Belikin Beer, the beer of Belize! Yes, Belize has it’s own beer, and it’s good! Come to Belize and join us on the island where we have a fridge permanently loaded with unlimited Belikin! This is the only beer I know of with a Mayan ruin on the label. You’ll love it! ← Belize Adventure Week improved!